Queenslander Alfred Warner served in the Dardanelles for more than two-and-a-half years, far longer than any of his compatriots, and yet you won’t find his name mentioned in any Australian military history. 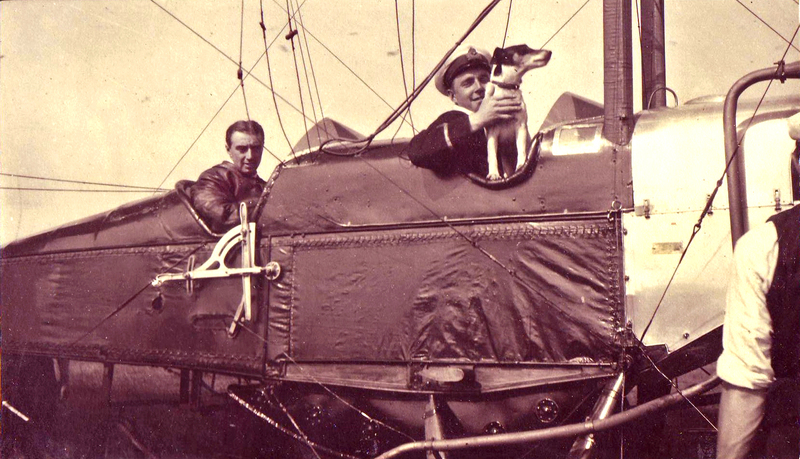 As Australia’s only airship pilot (and airship station commander), his war experience was singularly remarkable, much of it spent floating high above the sea lanes and battlefield of the North Aegean in what was [then] a state-of-the-art war machine. Australian military involvement in the Dardanelles effectively began on 25th April 1915, and ended with the successful allied evacuation the following January. These dates broadly define the Gallipoli Campaign which – a century on – still resonates here forcefully, especially with Australians of Anglo-Celtic origin. Following this evacuation Australia’s military focus shifted mostly to the Western Front and indeed, it wasn’t until after the Armistice in early 1919 that a small A.I. F (Australian Imperial Force) contingent – led by official war historian Charles Bean – returned to the Dardanelles for the purposes of documenting the campaign, and collecting relics for a recently proposed Australian War Museum. Despite having also served in the Dardanelles, Alfred Warner’s remarkable war service runs counter to this mainstream narrative. Unlike his Anzac compatriots who fought mostly on the Gallipoli Peninsula, or on – and under – its adjoining waters – his war was fought high above the Dardanelles in a truncated aeroplane fuselage, suspended beneath a huge hydrogen-filled balloon. What makes his story even more remarkable is that his service in the north Aegean lasted more than two-and-a-half years, and commenced long after the last Anzacs had evacuated the Dardanelles. A grazier from the remote township of Talwood in south-western Queensland, Warner was twenty four when he travelled to England in early 1915 to enlist – his elder brother Herbert having been killed on active service just prior to his departure. In May that year he was granted a provisional Flight Sub-Lieutenant commission with the nascent Royal Naval Air Service (RNAS). 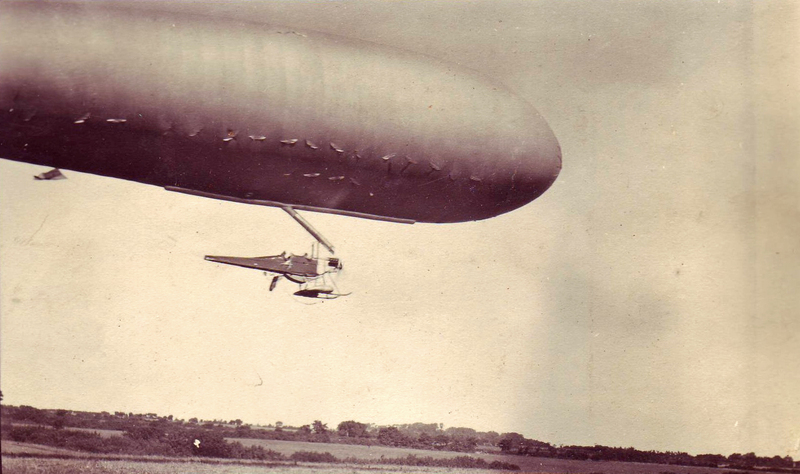 Although he’d trained in conventional fixed-wing aircraft he subsequently qualified as an airship (a.k.a. dirigible) pilot. Sea Scout envelopes were inflated with 60,000 cubic feet of explosive hydrogen gas. Remarkably, there is no record of any having exploded during the war (Simon Warner Collection). The British Admiralty had entered the war with just seven airships, hundred more being delivered – and ordered – during the following years. These were mostly two-person single-engine types, suspended below inflated [non-rigid] envelopes. Since they were used principally for anti-submarine patrol work (and for naval bombardment spotting), airship stations were also in the main situated in proximity to important sea lanes, or port approaches vulnerable to sea mines and torpedo attack. Following the Gallipoli withdrawal British forces remained active in the eastern Mediterranean, supporting the Macedonian Front with ground, sea and air forces. 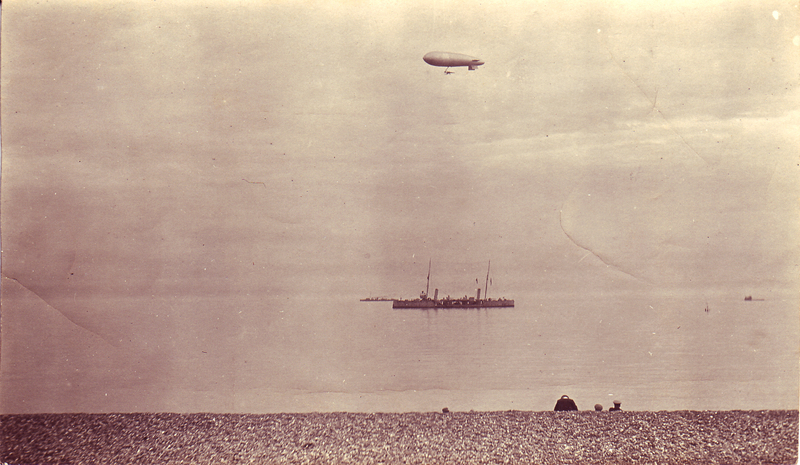 The latter, comprising both fixed wing aircraft and airships operated from both Mudros and Kassandra, 52 and 130 nautical miles, respectively, west of Anzac Cove. From here, the RNAS’s airships could guard the southern and northern approaches (i.e. the Dardanelles) to the Aegean Sea. Mudros was being bombed regularly by both German and Turkish aircraft, when Warner joined the Airship Expeditionary Force (AEF) there in mid-1917. Alfred Warner escorting King George V (Simon Warner Collection). Enemy submarines were a constant threat then for ships using the Gulf of Salonika, and the RNAS was alert to the possibility that SMS Goeben or SMS Breslau (German warships which had sought refuge in the Bosphorous at the outbreak of the war) might make a dash for the Mediterranean. In order to counter these threats the AEF had been assigned half-a-dozen Sea Scout (SS) airships which had been developed in great haste – in 1914. Although submarine sightings were rare the SS proved to be both an effective surveillance platform, and a deterrent (for German submarines). From a just a few thousand feet, a single airship could reconnoitre a vast area for anything up to seven hours at a stretch. Spared the horrors of trench warfare, airship crews nonetheless had to endure their own unique psychological stresses and physical dangers. With a top speed of 50 mph (80 km/h), and a bomb load of 73 kg, the SS’s performance was marginal. Envelopes were inflated with highly combustible hydrogen gas, the higher temperatures experienced in the Mediterranean further reducing both performance and load carrying capabilities. Engine failure was another ever-present hazard, with crews also having to endure prolonged exposure to cold winds (and rain) – in winter. 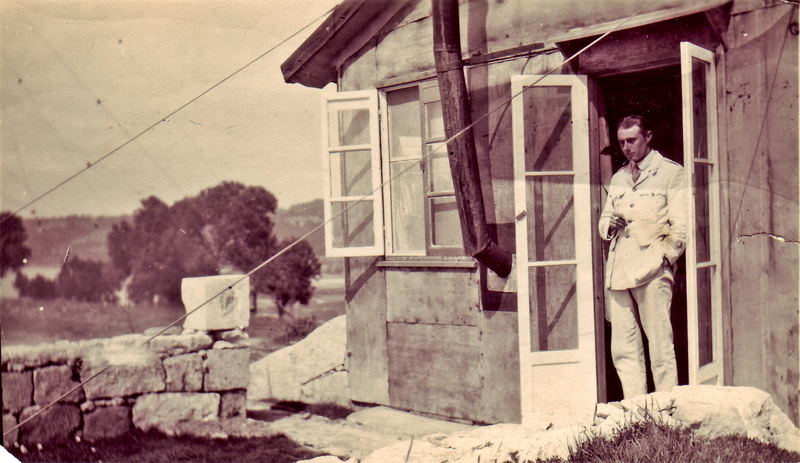 This photograph of Warner is thought to have been taken at Kassandra in Greece, where he was stationed for most of the war (Simon Warner Collection). Despite these risks and limitations, the airship station at Kassandra was still able to conduct long-range patrols on an almost continual basis, averaging eight hours of flying each day during August 1917. By November that year Warner had been given command of the Kassandra air station, its airships completing twelve flights that month lasting 80.5 hours (and covering 2,715 miles). These operations were seldom uneventful. AEF reports mention a submarine sighting on 7th April 1918, adding that that the pilot was prevented – by engine trouble – from pursuing the engagement. A submerged sea mine was also discovered – five days later – near the Greek Island of Skiathos. That same month, anti-aircraft fire was encountered (from the crippled SMS Goeben) during an aerial reconnaissance of the Bosphorous. 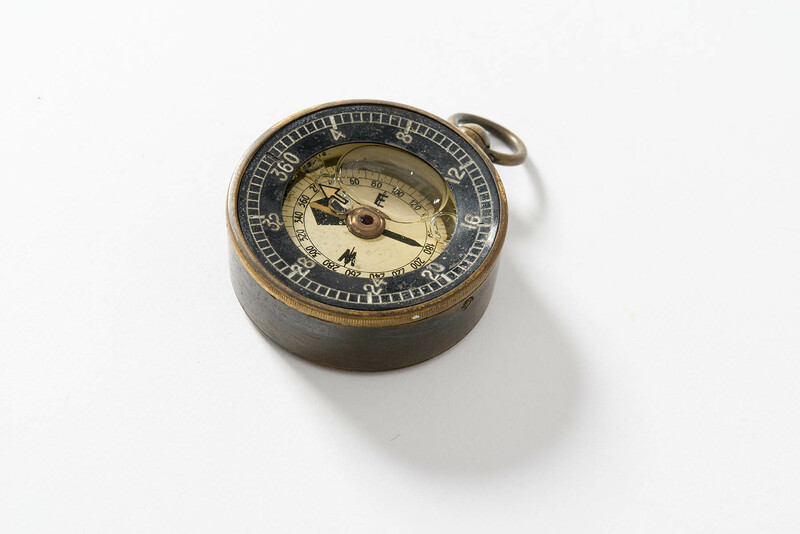 Warner’s wartime pocket compass (Queensland Museum Collection, H19508). By war’s end Warner – then a Captain – had logged more than 760 airship flying hours, which far exceeded the times typically recorded by conventional (i.e. heavier-than-air) military pilots. Following his return to Australia in late 1919 he resumed his grazing interest, re-enlisting with the Royal Australian Air Force the same that war was declared (viz. 3rd September 1939). He eventually relinquished his commission – at RAAF Archerfield – in 1941, and died in 1959. In1986 his son, former Queensland Parliamentary Speaker the Hon. John Warner (Qld), presented the Queensland Museum with the pocket compass that his father had carried during his long wartime patrols. Also gifted at this time was a chair which Alfred Warner had made from wooden airship propeller blades. Fitting tributes to a remarkable military career.